My name is Tyler Tachell, owner of To the T Home Inspections. 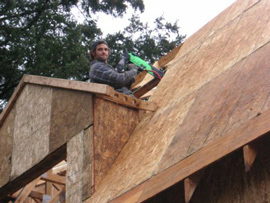 I have been in the carpentry field for over 15 years, specializing in new home construction and remodels. Through this, I found my passion in the trades. I became a licensed home inspector to assist people in understanding the details of their current or future home. The numerous components and inner workings of a house can be complicated and overwhelming. However, not being aware of problems that exist can result in an bad home purchase experience, not to mention expose you and your family to unsafe living conditions. To the T Home Inspections strives to educate and empower existing and potential home buyers. To the T Home Inspections serves the whole Puget Sound region and strives to provide a quick, easy-to-understand report at an affordable price. While I remain a partner in my family’s business, Tachell Construction, I am eager for the opportunity to bring my expansive knowledge and background to help you learn about your home.